I've been cleaning and reorganizing my house over the past couple of weeks and it always amazes me how much mess it makes to clean up and throw out stuff. Our home office was packed with a multitude of boxes and is just now breathable with a single box in the corner as a reminder of the battle that we've won. Course, the war ain't over. A portion of the scene above is definitely influenced by the sea of boxes. I'm sure you cannot tell exactly what... 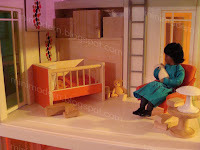 The crib is Bodo Hennig. The chair is Kitty Puppenmobel. The table is Voila Toys. The wall art is Charley Harper. All of the accessories are AG Minis, Irwin, Muji, and various run-of-the-mill craft items. I realy, realy like the orange armchair on the right !!! Are those the cars from the Muji mini city block set? Love those - I keep on resisting when we have corporate discount days at the MOMA. I think I also have a picture of a Pinky rampaging through mini-New York somewhere . . .
Really? I've always thought that I could travel there and find some cool pieces. Not true, huh? I thought it was just here in America that "the lack" persisted. Thank you for your nice compliments! Yes, the car and bus are Muji from the Barcelona set. Let me now if you find and post that picture. Very sweet! Question about the wall art -- I saw in another post that you use museum postcards sometimes -- very clever! How do you temporarily adhere artwork so that it doesn't damage the walls of your various houses? Thanks! I use putty, poster tape, double-sided tape, masking tape and sometimes painter's tape. The Kaleidoscope's walls are perfect for adhering art since the walls are all plastic. For the other houses, I usually take the art down within a few days so that it doesn't leave any residue but sometimes it does and then I use the Goo Gone stuff to remedy. I just found your blog a couple of days ago and keep coming back to peruse the archives. 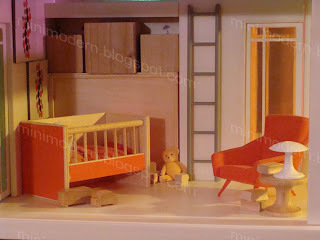 It's amazing how beautiful and clean the modern furnishings and architecture look in miniature. You are inspiring me to try an ultra modern look on my next project. Somewhere you posted that 8 people are interested in your blog (I'm sure it is many more) add me and make it nine. Thanks much! You will have to share what you create.